Michael Duffy is set to join Celtic. DERRY City’s Michael Duffy is set to join Celtic after the Scottish Premier League giants agreed an undisclosed fee with the Brandywell club today. The 20 year-old Galliagh lad had two trials with the Hoops in recent weeks during which he impressed Celtic coaches by scoring twice in an Under-20 game against Newcastle United, who had first-choice goalkeeper Tim Krul in nets. 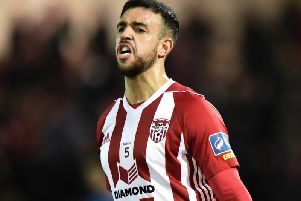 Duffy, who netted 15 league goals for the Candy Stripes last season had also spent a week on trial with Championship side, Brentford who were understood to be keen on offering the Derry lad a deal. The winger is understood to be currently discussing personal terms with the Scottish club. His imminent departure means Derry boss, Peter Hutton will now be handed funds to pursue further transfers to strengthen his squad ahead of the 2015 campaign.